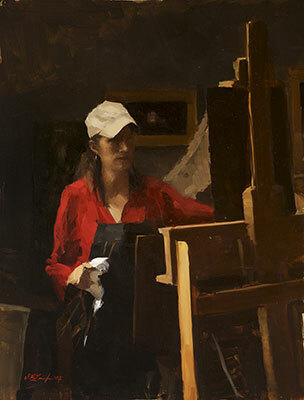 Sarah Lamb is a talented and dynamic realist painter. With classical skill—and through transparency, depth and texture—she captures the minute details of everyday objects in her dramatic still lifes and luscious landscapes. She makes us love the familiar and see beauty in the mundane. Born in Petersburg, VA, with a passion for art and an appreciation for the past, Sarah spent a semester at the Studio Art Center International in Florence, Italy before graduating from Brenau Women’s College with a BS degree in Studio Art in 1993. Following a summer workshop in Santa Fe, NM with renowned classical painter Jacob Collins, she spent two years painting at The Ecole Albert Defois in the Loire Valley with classical realist artist Ted Seth Jacobs. In 1997 she moved to New York and spent the next 6 years studying and painting under Jacob Collins at the Water Street Atelier. During this time, she had successful one-woman shows in major galleries in Atlanta, Houston, and San Francisco and was represented in art galleries in Alexandria, VA, St. Simon’s Island and Gainesville, GA, Sag Harbor, NY and Madison, CT.
More recently, she has had sell-out, one-woman shows at the Spanierman Gallery in NY, the Meredith Long Gallery in Houston, TX and the John Pence Gallery in San Francisco. She has been featured in magazines such as American Artists, American Art Collector and Southwest Art as one of America’s most talented young painters. British-born art critic, John A. Parks, wrote that "Sarah Lamb brings to her work a robustly sensual grasp of the world. Her keenness of eye and joyful brush make the whole enterprise feel freshly alive as she reminds us what the really wonderful things in life are." Sarah, her husband, artist, David Larned, and their daughter, Sadie, divide their time between Pennsylvania's Brandywine Valley and Houston, Texas.